Swami Okarananda was, in the past, a clerk attached to GODB (Gal Oya Development Board) who, in August 1956, relinquished everything, including his parents, relatives and left for Tennakumbura in Kandy, and surrendered himself to Swami Satchidananda. 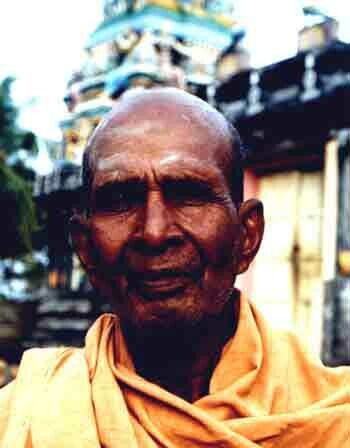 In 1965, Swami Omkarananda undertook an extensive tour of India. In Rishikesh he was ordained as Omkarananda Swami by the famous Swami Sivananda, President of the Divine Life Society. 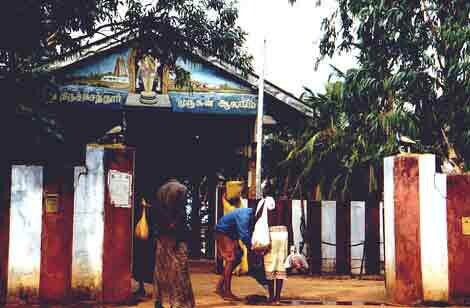 "Prior to Sivaratri Day, I was sleeping in my ashram, which is opposite to the Kallaimuvar Mari Amman temple. Then I beheld in a dream my tapovanam adjoining the seashore. There was only one palmyrah tree in the tapovanam. An old saint was sitting under this palmyrah tree. I asked him, "Swamiji, may I know who you are? Where do you come from, and where are you going?" "Then the saint pointed out to sea to the horizon and said, "I came from yonder, where Tiruchendur is situated. I am going to Kataragama. I undertake this pilgrimage every year. Every year I rest at this spot. If you will put up at least a cadjan hut at this spot, I can rest here comfortably." "At that point I suddenly woke up and could not fall back asleep. I realized immediately that the old swami in the dream was none other than Lord Murugan. I decided then and there that a temple must be erected at that spot. "I got up in the morning, took one of the stones lying there and chiseled it into the shape of a �Pillaiyar'. I put this Pillaiyar in my bag and cycled my way to the Kalladi beach. I reached the spot where the old swami had appeared in my dream. There was the palmyrah tree, just like in the dream. I constructed a small platform under this tree and put my Pillaiyar upon it. I started offering puja to this Pillaiyar daily and soon it became a place of worship. "About one year after this incident, Kavi Yogi Suddhananda Bharati visited Ceylon. From Colombo he made a visit to Batticaloa. I requested him to pay a visit to my tapovanam at Kalladi beach. He accepted my request immediately. "I hurriedly put up a cadjan hut under the palmyrah tree. 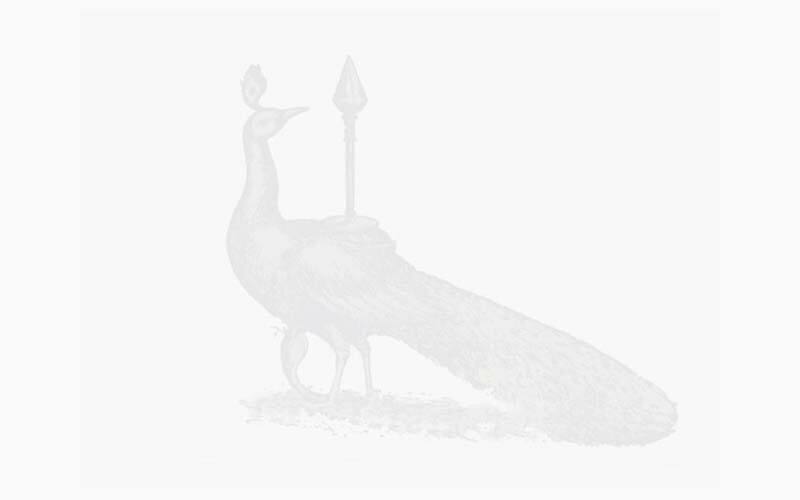 We also had a Vel and peacock image prepared immediately. "We took Kavi Yogi Suddhananda Bharati in a procession along with our Vel and peacock image to the spot. Kavi Yogi offered puja to these two objects and consecrated them on that spot. "This incident took place in 1966. From then onwards this place has been called "Eela Tiruchendur. "After a few years we had a statue of Lord Murugan made similar to that found in Tiruchendur temple in India and consecrated it in this temple. However, the entire temple was destroyed by the cyclone which swept the East Coast of the island on 24 November 1978. "But once again we erected a cadjan temple at this spot. Then we thought of building a permanent stone temple at this spot. We told the people of Batticaloa and they responded immediately. The foundation stone was laid in 1980. "The temple was erected in two stages. It includes Garbhagriham, Arthamandapam, Nirutamandapam and Tamba Mandapam. The Maha Kumbhabhisheka of this temple took place on 5 February, 1984." Thus narrated Swami Omkarananda the story of the founding of this temple. When we asked him, "Swamiji, Lord Muruga is famous for performing miracles for the sake of His devotees. Have any such incidents happened at this temple?" "Yes," replied the Swami. "He has performed several miracles. I shall mention only two of them." "When the construction of the temple was in progress, one night 13 bags of cement were stolen from the premises. We discovered this the following morning. We did not know what to do. "Suddenly, a young boy came up to me. He took me to a place and showed me all 13 bags of cement along with the culprit who had stolen the cement. "When I turned around to thank the boy, he was gone. He had suddenly vanished. The thief returned the cement bags to the temple and begged us to forgive him. "I am sure that the boy who helped us to trace the culprit was none other than Lord Muruga. "An artist called Selvam painted a picture of Tiruchendur Murugan in the front portion of the temple. As is the custom, the eyes are �opened' only when the entire painting is complete. "Selvam had completed the painting except for the eyes. Then he went for lunch. When he returned after his lunch, he found to his astonishment that the eyes of Lord Murugan were already 'opened'. No one could have done this so quickly at that height. Selvam showed this to me. "At once we felt that this was the work of none other than Lord Muruga. We celebrate this day every year to mark the miracle of Lord Muruga," so said Swami Omkarananda. Courtesy; Soodamani of 23 February 1996. Authored originally in Tamil by R.M. Sivalingam. English translation by Anbumani.